A neighbor was throwing out this old guitar, so I took it home. It has brazilian back and side, mahogany neck, and spruce top. Probably dates from the early 1900's. There are no markings anywhere to tell the manufacturer, but it is probably an old Washburn. The tuners work remarkably well, but I will need to make some kind of bridge for it and patch the back. Looks like it went through WWI and II, but I hope to make it playable. It has a beautiful ebony fretboard with cool inlays and tortoise shell pickguard. A nice little addition to my Larrivee family. Cool guitar,you may want to put your hand inside to see if it has a bridge plate. You may remember, in Sept. of 2011, I posted pics and description of an old parlour that is surprisingly similiar to your new find. It looks like the same construction, bracing, dimensions, etc. Mine had an identical floating bridge on it. The purfling on mine is a slightly different design. I determined through research that mine is likely a Lyon & Healy guitar made anywhere between 1900 and 1920. Since I posted that thread, I have indeed redone the guitar and made it very playable. I'm thinking you might be interested in how I redid the bridge and string attachment system as it would be very applicable to yours. My system worked out extremely well and has been stable for over a year now. It turned excellent in tone and it plays very loud for a guitar of this size. It is actually louder than both my L-07 and my Norman Dreadnaught. The system is of my own invention. Basically, I took a regular rosewood bridge and cut it down in length and width, and attached it to the top so the strings would go through at approximately the same place as they would have been located when they were attached to the old metal tailpiece. This bridge is only for holding the strings and sending vibrations to the top. It does not contain the saddle. I put a maple bridge plate under the new bridge to serve the same purpose as it would on a modern guitar. I retained the floating bridge concept by adapting the old floating bridge that had the brass saddle in it (exactly the same as yours). So I can still adjust the intonation by moving it. I had to do a fair bit of reshaping of the original floating bridge. For a saddle I inserted a thin piece of ivory from an old piano key edgewise into the old slot. I won't go any more detail here and I don't yet have pics of my restoration. I am going to revive the original thread and describe in detail the entire project. The guitar is a killer player now, especially for fingerstyle. 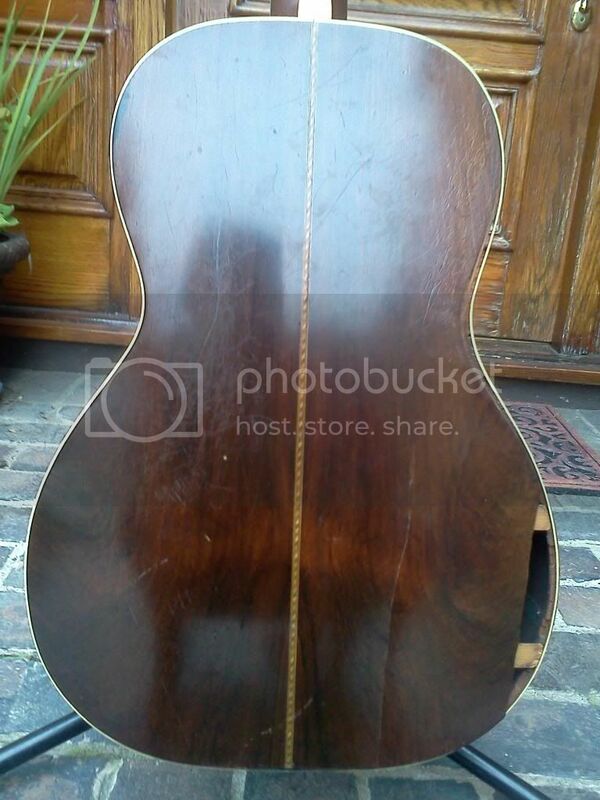 Or you could send it to Vintage Parlor Guitars for some restoration--especially if you're not handy like me! 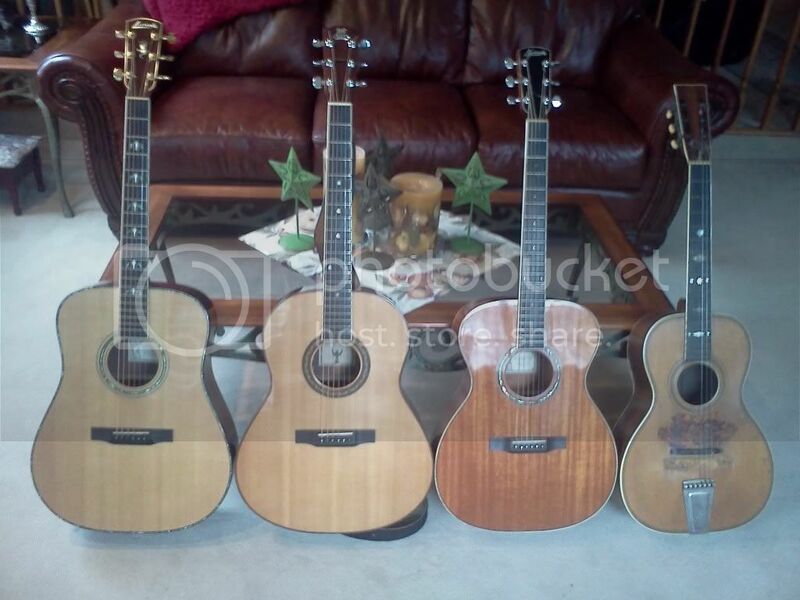 And I actually sent an email to vintage parlor guitars with detailed measurements, and all the same pics I posted here. I asked for any info on identifying it, etc. I did this not long after I got the guitar based on a recommendation from member sigurdd44. I never even got an acknowledgement from them that they recieved it. So I sent it again, and still no response. So I sent it again, and still no response. L07- I looked at your thread. Your parlor is quite similar to mine. It is definitely brazilian back and sides. The inlays on mine are quite stunning. There is a missing star that would have been abalone on the 2nd fret, then they alternate between pearl on 5th, 9th, and 15 frets and abalone on 2nd(missing),7th and 12th. 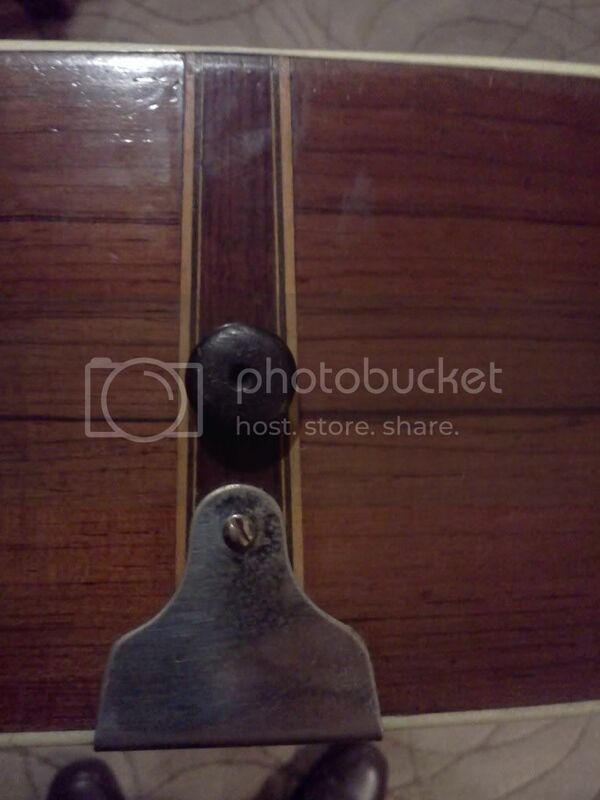 There is also ivoroid binding around the inside of the soundhole. It also has a nice inlay endpiece. The fretboard is definitely ebony, in quite good shape, and the tuners work very well. The movable bridge puzzles me. It had another bridge that was removed and the endpin holes were plugged. I am not sure if the metal bridge piece was stock, or added later. So I am very interested to see pictures of how you repaired your bridge. I stumbled onto vintageparlor.com's website when I was googling for old parlor info. I sent them an email, and he got back to me. 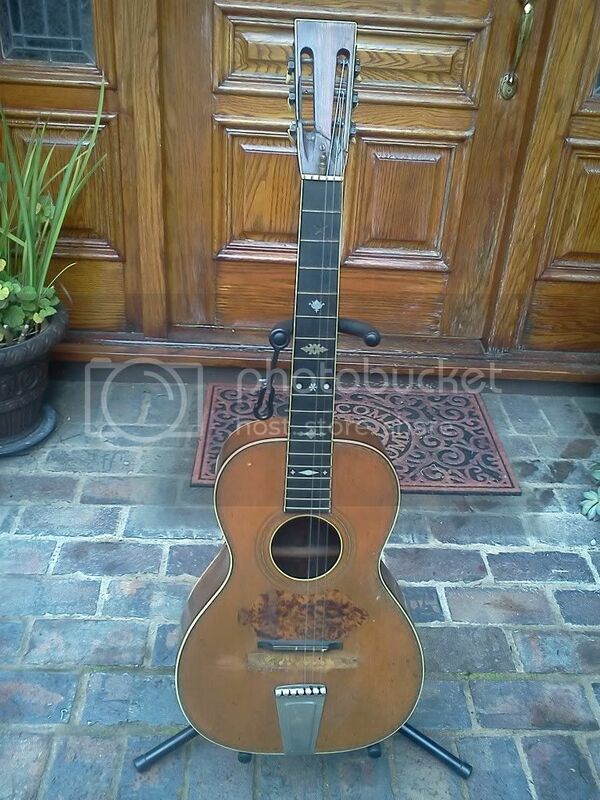 He agreed it was from the early 1900's, probably a Washburn or Lyon-Healey. Rob- It does have a bridgeplate under the spot where the old bridge was. I am thinking of getting a bridge and cutting it to size and gluing it. But I am not sure what to make about the floating saddle, which looks original. It looks like it is designed to float so you can adjust intonation. I would assume that since there are 6 plugged holes where the missing bridge used to be that the strings went through them. So the metal bridge may have been aftermarket? I would really like to take off the metal piece and use a conventional bridge if possible. The top has X bracing and a few other small braces. The back has ladder braces. I need a small piece of rosewood 1" x 6" to patch the back, and will need to glue the back braces to the kerfing, and then glue the ivoroid binding. The only other potential problem is the repaired headstock. It had a pretty good crack, but appears stable. The neck join at the heel looks intact, does not appear to have been reset. The neck is nice and straight. My guitar playing son (also has a Larrivee) is totally into this. He has only seen pictures, but I am going to visit him in Monterey this weekend. What a great father/son project! Any other suggestions are more than welcome. Here is a pic of the endpiece. Pretty nice little inlay. If my memory serve's me most guitars of that era had the floating bridge but it would of had a wood or bone saddle on it.Luthiers merchantile or LMI would be the place to get the wood from and you would be better of off cutting some of the back wood off and having a straight line to join up too.The bridge plate may have been added later in the guitars life so it could handle a standard bridge.You may be able to buy a prefabbed bridge that will cover the area were the one once lived.Take a straight edge and run it down to the bridge area so you can determine the bridge height.As always if I can help in you father/son project just pm or email me.Enjoy the adventure because it will be a fun one. I agree with Rob that the original bridge system would have been the tailpiece and moveable bridge. I'm thinking the other bridge would have been glued on later and then removed and/or pulled off and then someone went back to the original setup. The beauty of my solution is that the location of the "bridge" that holds the strings (think of it as a stoptail?) is not as critical as it would be if you installed a "regular" modern bridge in terms of intonation. I retained the moveable bridge aspect just for that reason. Plus my thoughts were it would give it a sound more true to it's original intent. I will take pics tonight or tomorrow and post them with details on what I did. I also had to remove and reset the neck on mine and repair several cracks in the top, back and sides. The seam down the back of mine was separated along almost it's entire length. Another interesting fact about mine that I didn't mention is that it has a 4-piece top. Seems kind of strange as I imagine it wouldn't have been a big deal to find spruce big enough to make a regular 2-piece top. Especially on a guitar that is so small. So I wondered if it was done that way for economic reasons or for some other reason like tone, or maybe even construction limitations at the time. And yes, it would make a great father son project. Stay tuned for details tomorrow. Thanks for your input. I am planning on making the ragged edge straight when I patch the back. I sent an email to Larrivee in Oxnard. Would you believe Matthew L got back to me almost immediately and offered to send me a small piece of rosewood to patch, and maybe a bridge. What a great company! I had the privilege of meeting Jean, Matt and Wendy when I toured Oxnard 3 years ago. Kurt, I will look for your pics to see how you jimmy-rigged your bridge. Last night I cleaned the inside of the guitar and checked the braces. It appears amazingly intact, with the exception of the hole in the back where the ladder brace will need to be glued to my wood patch. Is wood glue what I should use to glue the ivoroid binding to the back/side joint? I also cleaned the fretboard with super light steel wool, and the ebony is in great condition. I would like to try to find an abalone star to fill in the missing inlay on the 2nd fret. The low E string tuner is missing the screw gear that meshes with the tuning gear. Is that something I could find easily? Here is a pic of the missing screw gear. You can also get small sheets of the material and cut your own inlays. If you look at the bottom of the page you will see what they recommend for glueing the inlays. For bindings, regular wood glue or hide glue should work fine. I have a couple of sets of old tuners in my pile of parts. I'll check to see if I can find a couple of gears/screws that might work. I'm just about to take the pics of my restoration. I will post them in the next couple of hours. Further to my last post, I checked my spare parts and I don't have the gear/screw you are looking for. Mine are all imported and I'm sure the screw threads won't fit on your american made tuners. It shouldn't be too hard to find some though. Maybe someone else on the forum has some? Or a local luthier or guitar tech? Andrew, after reading your post I emailed them again and lo and behold, they did indeed answer this time. Steve, the guy there, figured it is a Lyon and Healy or possibly a Regal brand. He also quipped that it's definately a keeper. 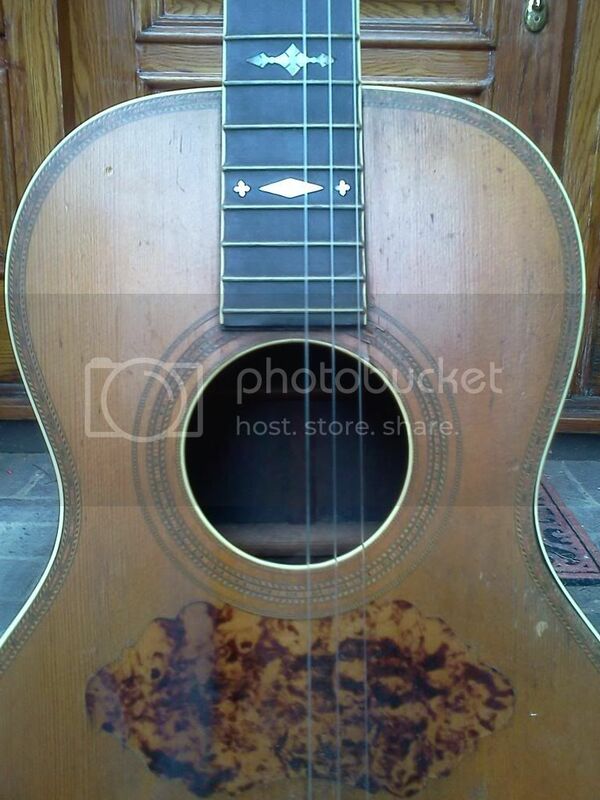 From my own research, I'm pretty sure it's a Lyon and Healy guitar made between 1900 and 1920. They also made the Washburns of the period which were the elite models. I think 247hoopsfan's guitar is a slightly higher end model than mine made by the same company in the same era. His has the neck binding and mine does not. Mine was actually in better shape than his when I got it, though. And it seems mine has had fewer attempts at modification than his. I am just about to update the original thread about my old parlor with pics and description of my "restoration" of it. Went thru my box's of tuners and parts,sorry nothin. Depending on the level of finish you hope to achieve on this little beauty, I would just replace the tuners--as a nice upgrade (unless the shadows are deceiving me, it looks like your D post is bent). Stew-Mac has the Vintage look-alikes (but pricey), but there are so many others. I have the old tuners that I replaced (China made?) from my harp guitar; you are welcome to them if you want to piece them out or use whole, but I had issues with the G gear (I think there is a bad spot in the worm gearing--not too bad, but I wanted better)...so, as I say, it depends on what level of finish you plan on. Let me know, and I will drop them in the mail. 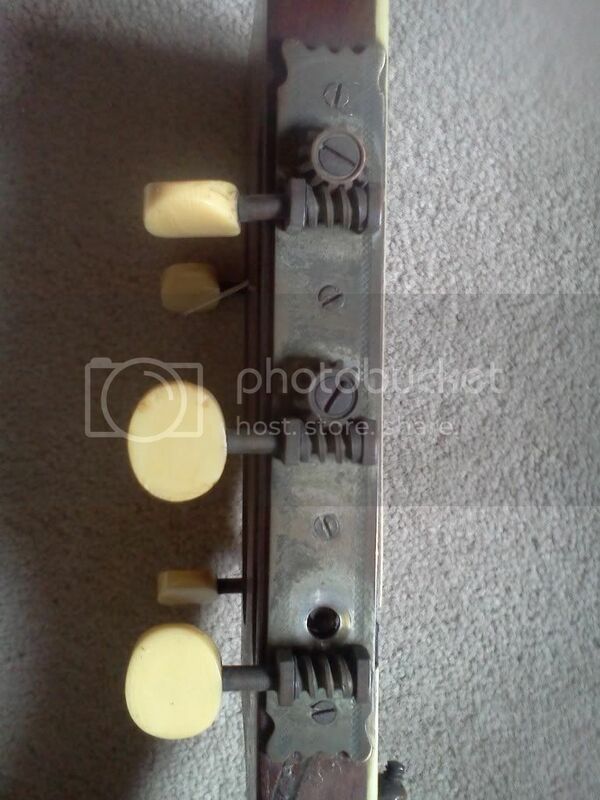 They are silver with silver Schaller-shaped knobs, for slot head (of course). Your guitar is identical to mine including the deep V neck, the purfling, binding and the color of the finish on the neck and headstock back. Mine is not black on the headstock front though. It's the same finish as on the back and neck. Mine even has the same wear marks in the same location from picking. I'm surprised the original bridge is like a modern one and not a metal tailpiece like mine had. Here are pics of mine with the new bridge setup I did to it. The last picture is how it was when I got it. I have glued the 2 loose back braces where the damage on the back was. Since there was some separation between the back and sides, I took off the binding and re-glued the back and sides where they were loose. Everything fits snug and tight now, and as soon as I get a piece of rosewood I will cut to fit and glue it to patch the back. The original binding is still intact, so I will be able to re-glue it once the patch is in place. The top is actually in pretty good shape. All I had to do was glue 2 spots where the binding was loose. A few of the frets had sharp ends, so I carefully filed them down. I strung her up with EXP16's. I have not yet located a screw gear for the bass E string tuning peg, so I only have 5 strings. This little parlor has quite a voice! It is quite loud for such a small guitar. I am using the original movable bridge, and found a happy spot where the intonation is right on. It makes beautiful music, even with 5 strings. You can tell it has the characteristic glassy, bell-like tone of brazilian. The harmonics ring easily and clearly. I am going to go to Gryphons in Palo Alto next week and see if they might have a tuning screw gear that will work. Can't wait to get the hole patched and get the E string on it. So far, my restoration cost is $0!